Has anybody actually seen the sunny side lately?? Here in Vermont, it has been raining almost every day for nearly seven weeks. We have savored intermittent hours of gorgeous sunny weather, but even those heavenly days have usually been punctuated by fierce thunderstorms bringing down trees and bringing on flash flooding. The soggy weather is bad enough in isolation. After each long winter, we Vermonters love and crave our summers. This year, though, it’s our plants that need more sun. It was a bad year for strawberries. Most of my friends proudly grow a big vegetable garden each year; today, some of their veggies are drowning. Then there is the intensity of the storms — frightening and unusual this far north. We’ve had massive flooding in our little state, with roads washed away, houses seriously damaged, and at least one drowning. On the home front, I’ve been feeling stressed and distressed about my son, who earns a good chunk of his yearly income painting exteriors during the summer. He had lots of work lined up, but has been getting washed out day after day. And then the next day and the day after that. He’s not earning much money, and it’s discouraging to be idle for such long stretches. He tries to keep summer rain in perspective, knowing there’s nothing to do about it — but his attitude has been severely strained by this seven week wet stretch. 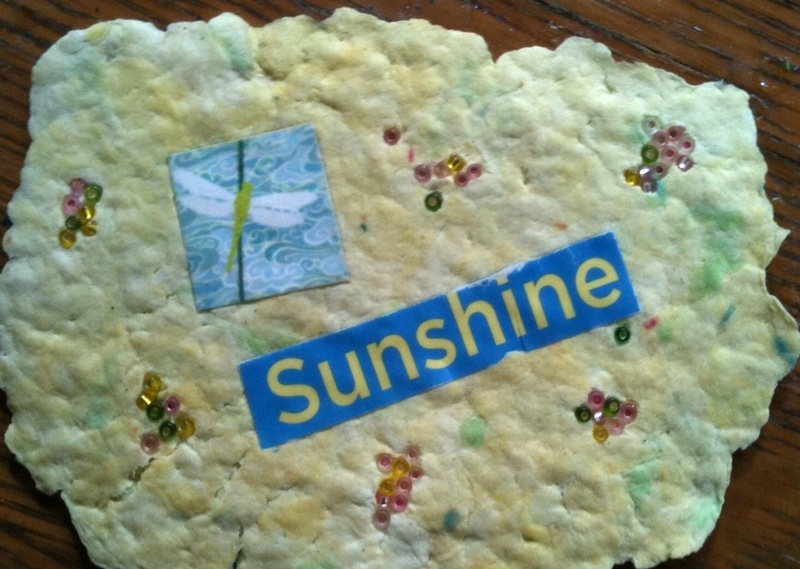 One of the kindness cards I made to create more internal sunshine. I know there are many more Vermonters out there, in various jobs, who are really suffering financially from the weather — including, of course, farmers. Which brings us to the bigger picture. If this is this the new face of climate change in Vermont, how will we grow our food? Too much rain seems less frightening than not enough rain, but unrelenting storms could devastate our food supply. I keep thinking about Barbara Kingsolver‘s book, “Flight Behavior.” I won’t spoil the ending, but there is a lot of rain in her brilliant climate change novel — and it’s not a pretty picture. Talking about this with friends and neighbors … there’s a certain amount of jitteriness and foreboding. Listening to the radio is no better. Whether it’s the local Vermont Public Radio or National Public Radio with shows about such topics as Antarctica melting and the doom this spells for Miami, there is plenty to weigh down anyone with their eyes open. I’m willing to allow myself some time here and there to feel blue, discouraged, frightened, etc. Overall, however, I think it’s more important than ever to “Keep On The Sunny Side.” Watching and singing this inspiring bluegrass song by the Carter Family — performed here by The Whites — puts a smile on my face and lifts my spirits. Perhaps because of all the rain, this song about sun (mostly metaphorical) has been very much on my mind. Last Sunday, when I had the opportunity to do another guest sermon at the Washington, Vermont Universalist Church, I chose this song as one of the hymns. On Monday and Wednesday, I introduced it to the local bone builders group. I’ve even been singing it to the grand baby. This song has me wondering, how can I keep on the sunny side? How can you? I believe we’re all in for a rocky climate change ride, and we’re simply going to have to make the best of it. Happier people are more resilient, more creative problem solvers, and more optimistic — all much needed traits today and in the months and years to come. Which is why I think it’s so important to understand how to cultivate genuine happiness, and then do that. So, yesterday, after hearing about how Miami will be under water in the not too distant future, and worrying that my son won’t be able to pay his rent, I decided to focus on happiness. First, I worked on making kindness cards fashioned from recycled paper slurry and donated and/or salvaged odds and ends. My plan is to pass these cards around to strangers. I’m not sure exactly when or how that will happen, but the act of creating the cards made me feel kinder — and, happier. Second, having a purpose is vital to happiness. I’ve just come up with a plan for using far less propane in our house — thus, helping us be more resilient to climate change fall out while also lessening our own contribution. This plan will involve a lot of work as we reconfigure how we use and heat our home — but I’m excited by the goal! I’m ready to dig in and get started. Third is exercise. Yesterday morning after swimming in the lake, my grumbly self almost skipped bone builders. I didn’t have time to eat breakfast or change clothes, but I knew I’d feel better afterwards if I went. So I went to the community center still in my wet suit and had a great time with my fellow bone builders — including singing “Keep On The Sunny Side” to some back leg lifts (with ankle weights). And I did feel better, thanks not only to the exercise but to the community of women sharing this experience. Last night, though no yoga teacher showed up for our usual Wednesday night session, the three of us who were there created our own workout — and community — and it was great. There is more, of course, but those were the big three that helped me get my happiness equilibrium back yesterday. And today? The sun actually came out by noon. It is glorious. Thanks, Ginny, for your excellent reminders. I’m going to listen to that song now. I’m also always on the lookout for opportunities to laugh. I just got the old movie “Nightshift” from the library and am looking forward to some stress-preventing howls and chuckles. THis will help me stay on the sunny side!